It's a beer set to boldly go where no beer has gone before — and it launched in Calgary this weekend. 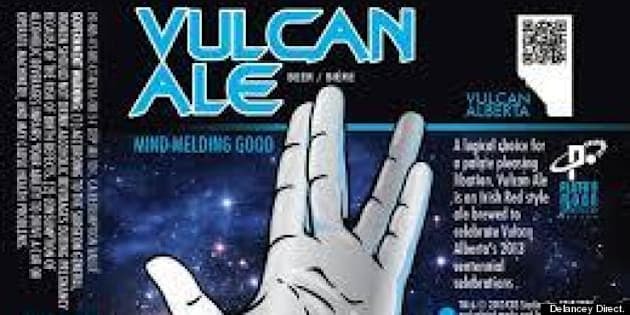 Vulcan Ale is the brainchild of two Star Trek superfans from Calgary and Airdrie who also happen to own a beer distribution business. It's the first Star Trek beer to be licenced in Canada by the franchise and it officially launched Saturday in Calgary. "I think I was 14 when the show first aired," says Paul Carreau, a Calgarian and trekkie with DeLancey Direct, the company behind Vulcan Ale. "I watched it and watched it and even before then I was into science fiction so that was something that really appealed to me." The Irish red ale, brewed by Harvest Moon Brewery in Montana, officially launched at Beer Revolution on Saturday. "Vulcan is supposedly a very hot planet and most Irish people I know can be very hot-tempered, so it seemed appropriate," Carreau says. Vulcan Ale should be on liquor store shelves on May 17th, coinciding with the release of the new Star Trek movie. All proceeds will go to The One Fund to support those affected by the Boston Marathon bombings.